When’s the last time you asked yourself, “Why am I doing the work I’m doing?”. And not because you need to pay the bills, but of all the different ways of working, why do you work the way you do? Samantha Attard is going to explore what it means to work with intention. She is the founder of BeHappyHealthyHuman. She helps people find harmony in their natural rhythms, schedules and nutrition in multiple roles as a vegan cater, yoga instructor, coach and by selling health snacks based on your energy needs. Difference between self-reflection and doubt. How different foods affect her energy level. Why she decided to create multiple revenue streams for her business and how they feed into each other. 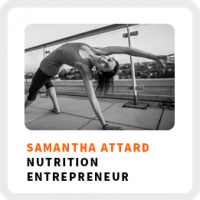 Power of persistence required to build her healthy snack business. Wake up time: 6:00 am. Core work activities + habits: 1) Building up sales for the snacks. 2) Being present to the community and being there for them. 3) Getting creative with sales and focusing more on that. Ideal work environment: On a beach, outside, at a standing desk, or somewhere with a view of the ocean. 90-day goal: Launch a seasonal granola product and have 20 new Ayurveda clients. 1) Try to not use a computer or any technology while eating. Try to be there to listen to your body and not be focused on a screen. 2) Set an alarm for 1 – 3 hours after you eat. Use that as a way to examine how the food makes you feel as time passes. 3) Understand that setbacks do happen. try to examine days as a post-mortem and see what may have happened.